Statement by the Communication Service of the Moscow Patriarchate Department for External Church Relations. The tragic events caused by the unprecedented terror employed by militants against Christians in Iraq urge the Russian Orthodox Church again to raise her voice in their defence. About 1,5 million Christians lived in Iraq before 2003. Religious radicalism, banditry, continued terror attacks, killings and discrimination against Christians, which began spreading as far back as ten years ago, have led to a situation in which most Christians have had to leave the country. In June 2014, militants of the extremist movement “Islamic State of Iraq and Levant” (ISIL), known earlier for their savage reprisals against Christian civilians in Syria, began their onslaught in northern Iraq. With their invasion in the city of Mosul on June 6, 2014, Christians afraid of persecution began leaving their homes en masse. According to AINA new agency, all the 45 Christian churches in Mosul were destroyed, looted or turned into mosques. Eleven churches were burnt to ashes. 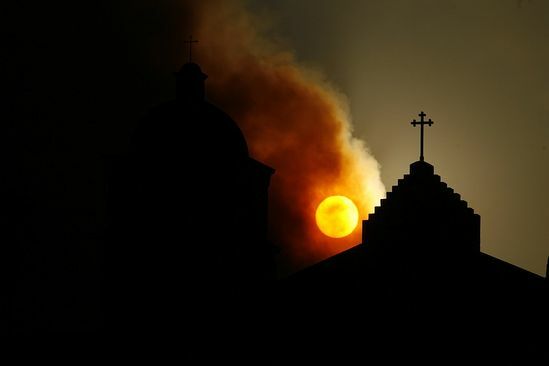 On July 7, 2014, during a meeting of Primates of the Middle East Churches in Lebanon, the head of the Chaldean Catholic Church Louis Raphael I Sako cited evidence from eyewitnesses who saw the ISIL militants destroying crosses on churches, burning down old manuscripts and church vessels. Christians were ordered either to leave Mosul or convert to Islam; those who refused to do it were savagely executed. At present, there are 70 thousand Christian refugees in Erbil, many of them having to spend the nights in the open. In Dohuk, there are over 60 thousand refugees. The mass media have reported that in Mosul, militants are executing Christian children on a regular basis, beheading them and then putting their heads on display for intimidation of the population. Women are being grossly abused. On August 7, 2014, extremists seized the city of Karakosh populated mostly by Christians. Some 50 thousand Christians had to leave the city. Some Christians fled to Erbil while others to the Iraqi Kurdistan. According to charitable organizations in Iraq, refugees – many of them are hiding in mountains – are standing in acute need of water, food and clothes; people staying in refugee camps have began to die of starvation and thirst. Despite the attempts of the Iraqi authorities to organize aid supplies, the humanitarian disaster continues to spread. The cruel aggression against Christians in Iraq has become systemic, turning into a real genocide. Ideologists of the so-called “Islamic State” are carrying out the task of total eradication or banishment of Christians from the territories that they have come to occupy through massacre, forced deportation and property deprivation. Meanwhile, proponents of this grouping are openly holding demonstrations and propagating the militants’ symbols in various European countries. The problem of Christians’ hardships in the region has been raised for several years now by the leadership of the Russian Orthodox Church. “Again and again we state the need to stop the violence, to resume peace political dialogue and call to defend the persecuted minorities. I would like to stress that the growth of religiously motivated extremism is a serious challenge to the entire world community”, His Holiness Patriarch Kirill of Moscow and All Russia stated on May 28, 2014. The terror unleashed by extremists against Christians and people of other faiths in Iraq deserves to be resolutely condemned. The Moscow Patriarchate calls upon all the political forces concerned and all the people of good will to exert every effort to defend the religious minorities in Iraq. The vanishing of the oldest Christian presence will have far reaching, catastrophic consequences for the entire region. We express solidarity with our suffering brothers and sisters in Christ and hope that the international community will take all the measures necessary to save the Christian community in Iraq.